Everyone has a niche. I like doing so many things, it’s difficult at times to stay forward on any particular avenue. I find myself at times….as I’ve said before….trying to do too many things at one time. The only thing that gets me is disorganization, so it is important that I get a handle on this now; especially since I do believe I have settled into a groove that is I believe is my niche. I like to write, I like to write poetry, I love to create designs with my Serif DrawPlus X5 software….I’m really in my infancy using this software, learning new things all the time. 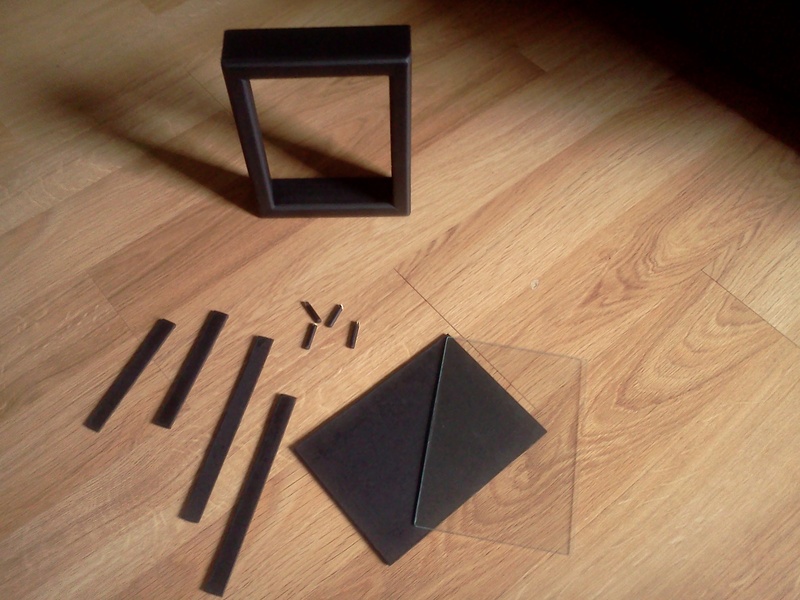 I like putting stuff together….measuring, cutting, drilling. I can never shake that feeling that this is where I’m supposed to be….doing what I love to do, working my passion. But I do know there are so many different types of artwork out there it’s hard to get noticed. As I continued to search for that one thing that really settles in on ya….I came up with a way to utilize all of the major things I love to do, all in one. I like to be unique in some way, either in my artwork or with some thing I have in my mind to put together as a clock or some other piece. The ideas I have for clocks right now are nothing really fancy, but different enough to bring that hmmmm…. What I am offering may not be any different than anything else out there, but it is unique. I did a post on the origin of MyQuesMark. I’ll have to dig that up again so you can see the different changes that have come along….I should do that soon….. I started this clock with MyQuesMark on a blank page…no background. 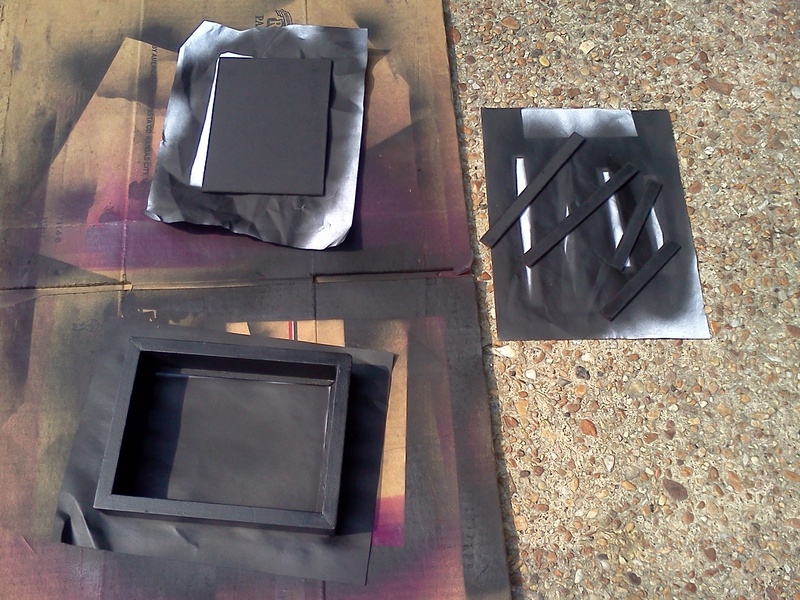 Once I found the color combination I liked I started to write….. The colorization of MyQuesMark usually sets the tone for the overall color of the total clock design….but not always…..the background is almost always next to the last thing to do. My signature is included along with the date stamp. The date on the clock represents when the design was completed on ‘paper’. I thought it would be nice for people to know when the clock they purchase was first ‘born’. Here are pictures of a prototype I put together to see what it would look like. 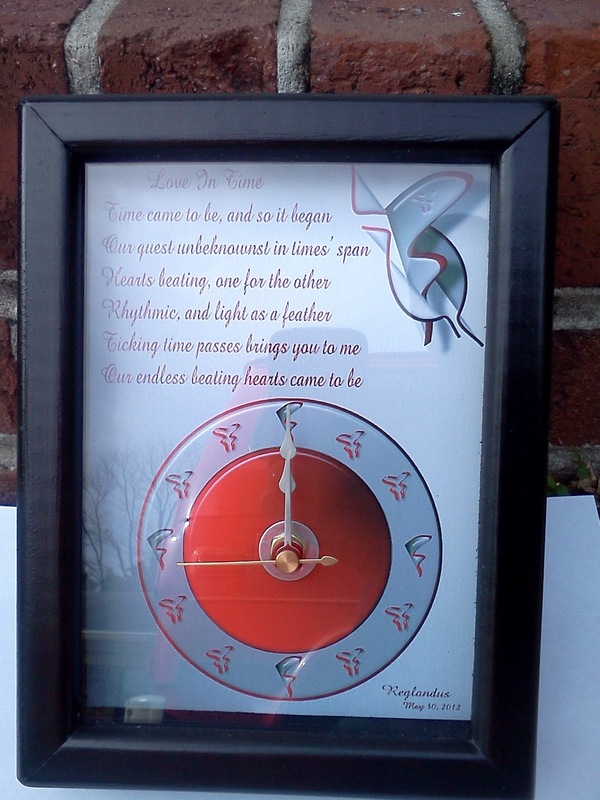 This will be in MyQuesMark series of clocks titled ~Love In Time~ named after the poem. The early edition of my clocks are a bit rough but will improve. Saying that I will follow up with this….I make each clock one by one. They will not be perfect, but will be well made, sturdy and strong. I take pride in my work and what you are about to see is my very first shadowbox. If you like the homemade rustic look with a touch of elegance, you will love my clocks. The clock above is one of three art designs I took to my old job at Safelite Autoglass to see what kind of feedback I could conjure up. They were very well received by everyone I had a chance to talk to. Before leaving, I had two orders in my pocket….I wasn’t expecting that but I was delighted! Brian, who works in the warehouse was the first to put his order in. The designs I had with me were not a good fit for Brian so I asked him what he wanted and he said for me to surprise him….as long as it had the Pittsburgh Steelers colors. I had just finished a new design the day before I thought he would get a kick out of. This one didn’t come with a poem, but a touch of humor….I added the colors he wanted and this is what turned up. The pictures I took don’t do justice to the actual printout. Moments after it comes alive…. My shadow boxes are designed so the clock kit fits deep enough to allow the flush fit of the clock against the wall….notice any imperfections?…. I delivered the clock to Brian this morning….. Here is Brian proudly holding his MyQuesMark Lookin’ At Clock. I can’t forget my other order….the following is a prototype of the artwork that order belongs to. Theresia will be the first recipient of the final design for the 8 x 8 she wants and that will be available. Brian opted for the 5 x 7. The design of the clock Theresia chose is originally in 8.5 x 11 so I had to make adjustments to accommodate the difference in size. No one sees the finished product on that one until it ‘comes alive’. This is actually the second draft of the design. This one had the pleasure of occupying the frame as a clock when I went to my old job. I chose arrows to symbolize direction…not as a weapon. This is the first draft of the design. This is really getting jump started before I was ready because I really haven’t launched yet, but how could I turn down such an opportunity. I would like to get more feedback on the clock designs from you…my readers. I will be posting pictures on my Facebook page and your input would be greatly appreciated. If you would like to keep up with my progress….and giveaways….and what new designs are on the table, you should subscribe to my posts. I’m not just doing clocks….